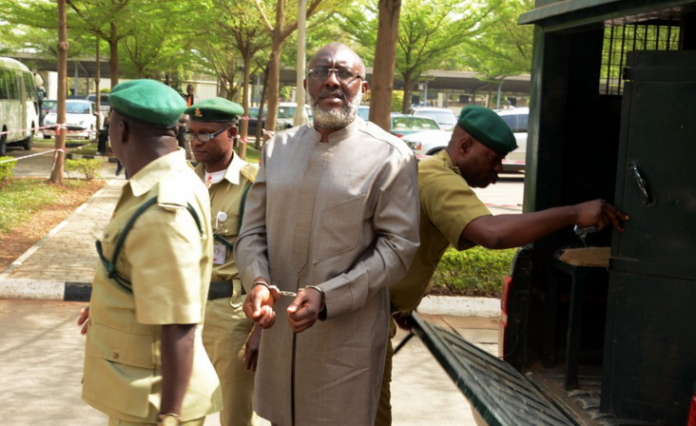 The National Publicity Secretary of the Peoples Democratic Party, Chief Olisa Metuh, was driven off in a prison pick-up van ‎from the premises of the Federal High Court in Abuja, shortly after he was granted bail in the sum of N400m by the court on Tuesday. Metuh, who was produced in court in handcuff for the bail hearing on Tuesday, is to remain in prison till when he meets the bail conditions. After the court delivered its ruling on Tuesday, prison officials led him to a waiting pick-up van and he was locked up at the rear cabin of the vehicle. Justice Okon Abang, in a ruling shortly after Metuh’s bail application was argued on Tuesday, granted the PDP spokesperson in the sum of N400m with two sureties in the sum of N200m each. The judge also ordered that the two sureties must own property in Maitama, Abuja. The judge also ruled that the sureties must produce the certificates of occupancy of the property which must be verified by the Chief Registrar of the court and confirmed by the Economic and Financial Crimes Commission. The judge, who also ordered that Metuh must deposit his traveling documents with the court pending the period of his trial, also ordered the EFCC to verify the residences of the sureties who must be resident in Abuja. Justice Abang had on January 15 ordered the PDP spokesperson to be remanded in Kuje prison shortly after his arraignment on seven counts of money laundering preferred against him by the EFCC. The EFCC alleged in the charges that Metuh, who was arraigned along a firm, Destra Investments Ltd, received N400m, part of the money meant for the procurement of arms, from the Office of the National Security Adviser in November 2014. The judge ordered on Tuesday that Metuh, who appeared before the court in handcuffs for the bail hearing, ordered the PDP spokesperson should not be released from custody until he meets the bail conditions. But in granting him bail on Tuesday, the judge dismissed EFCC’s objection to the application ruling that the allegation that Metuh destroyed his statement and attempted to influence potential witnesses while in the custody of the anti-graft agency was not substituted. His separate fundamental human rights enforcement suit is scheduled to come up for hearing before Justice Abang on Wednesday. Justice Abang held that such prayer could not be entertained in a bail application but only under a fundamental human rights enforcement suit.